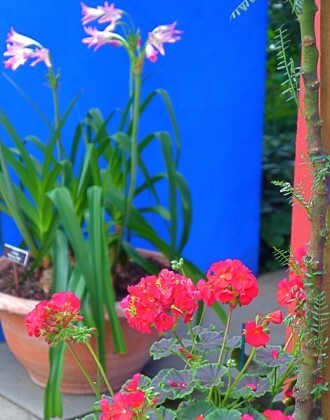 Into the Jungle: From the Closet to the Garden; What is Beauty? What a coincidence! These embroidered satin ballet slippers are very nearly the color of the fragile antique pansies blooming in late spring garden. In “Ode on a Grecian Urn” Keats famously defined it as “truth.” Five little words–“Beauty is truth, truth beauty”–unleashed a torrent of critical questions, among them, a big one: What exactly is truth? Was Keats exploring the relationship between art and nature, as some think, or was it a more pointed critique of the limitations of art? Whatever the poet intended, I imagine most of us would say the natural world is a genuine source of beauty. Kayaking through the enormous icebergs of Alaska’s Glacier Bay as sheets of ice splintered and crashed into the aquamarine water, for instance, literally took my breath away. And in New Mexico the ultraviolet twilight that descends on on Santa Fe’s high mesa always makes my heart bloom, pulling my nose away from the grindstone, forcing me to look up and marvel at the luminous beauty of the big picture. Face to face with the grandeur of nature, one can’t help but feel the tug of something greater than ourselves. 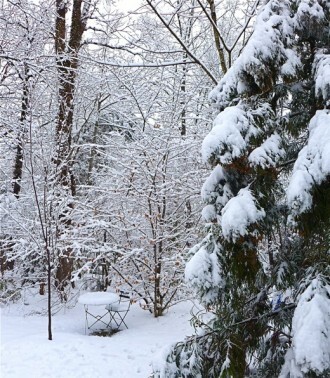 The garden, by contrast, is a place of small artifice. Whether it involves the tangled flowers of an English cottage border or the severe (but somehow pleasing) geometry of a French parterre, the hand of man (or woman) is clearly evident. Every rose, every Japanese maple has been planted, for better or worse, in a chosen spot, while often enough, weeds, aka unwanted natural vegetation, are ruthlessly tossed into the bin. 8:05 PM: This early evening glimpse of our woodland illuminated by “fireflies” only hints at the otherworldliness of the scene once darkness falls. B and I are certainly not immune to artifice in the garden. This very week, workers have been putting the final touches on the canopy of firefly lights that now illuminate our woodland at night. 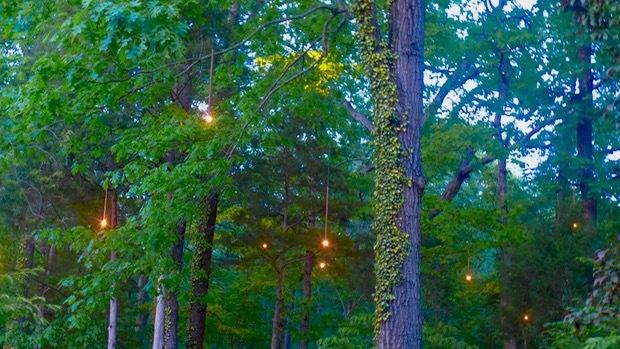 Suddenly that dark, not so inviting thicket of trees and shrubs has become a place of magic, where the starlight streams from 20 watt bulbs in dangling copper tubes and a clutch of LEDs creates the illusion of dappled moonlight. Being a deeply shallow person, I readily admit that I’m as attracted to artifice as to the wonders of nature. Especially when it comes to flowers. And nowhere are faux florals more deliciously abundant this season than in the world of fashion, where designers are currently indulging in a newfound passion for embroidery. Why at this very moment all sorts of posies are blooming in my own closet. You’d think you were in the garden. 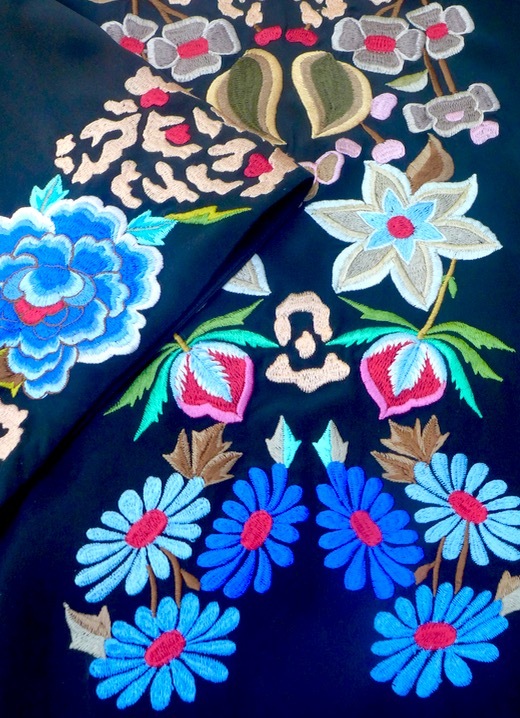 Strange flowers from the embroiderer’s imagination cascade down the back of Alice Temperley’s alluring kimono jacket. Late this winter Alice Temperley’s luscious silk crepe de chine kimono jacket landed on my doorstep (thanks, Net a Porter! ), erupting with improbable flowers that could only have sprung from an embroiderer’s fever dream. The bizarre blossoms remind me, ever so slightly, of Baudelaire’s Fleurs du Mal: dangerous, but oh so alluring. Slide this jacket over an inky charmeuse camisole, and slip right off to a smoky, lantern-lit canteen where a cheongsam-clad bartenderess serves killer cocktails with names like Lotus Blossom and Loss of Hope. 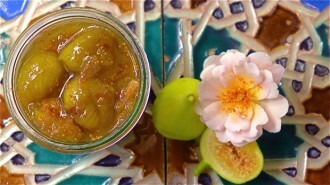 In a louche mood, you’re mere steps away from the opium den. 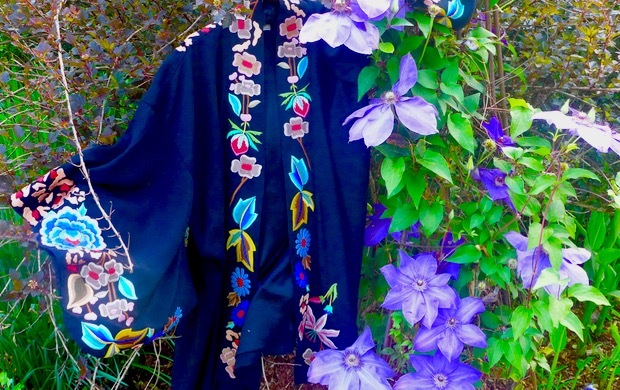 But in the early morning light of spring, the flower-bedecked kimono is equally at home in the garden, especially when bordered by the unearthly lunar blooms of the ‘Sikorski’ clematis and the witchy tendrils of the red-leafed ‘Diablo’ ninebark. 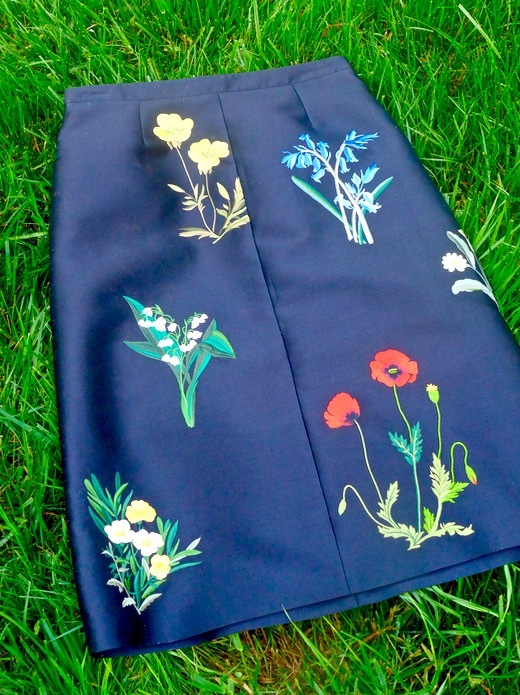 The embroidered bluebells on Stella McCartney’s flower-strewn silk twill skirt resemble a stylized botanical illustration. Spring came early this year, courtesy of El Nino and global warming—and with it, Stella McCartney’s embroidered skirt. 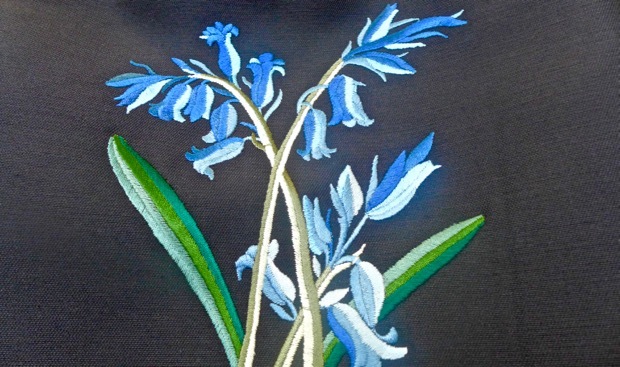 I love these English bluebells, floating on a sea of lustrous black silk twill. These and the other flowers resemble botanical specimen drawings set adrift in the night. 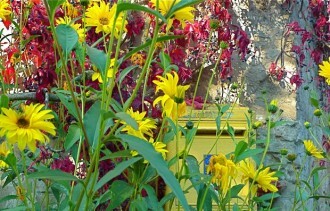 Our own bluebells and snowdrops are long gone, but we can still look forward to summer’s poppies and golden coreopsis. In the meantime, this flower strewn skirt, um, skirts the seasons in the tall grass–when it’s not sashaying out to dinner. Etro’s embroidered satin ballet slippers are dream shoes, so delicate and fantastical that they can scarcely be worn outside in good conscience. 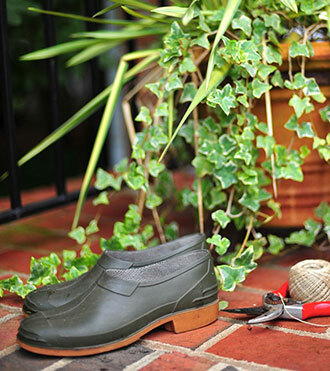 Oh, and let’s not forget the many tempting embroidered shoes on offer this spring. 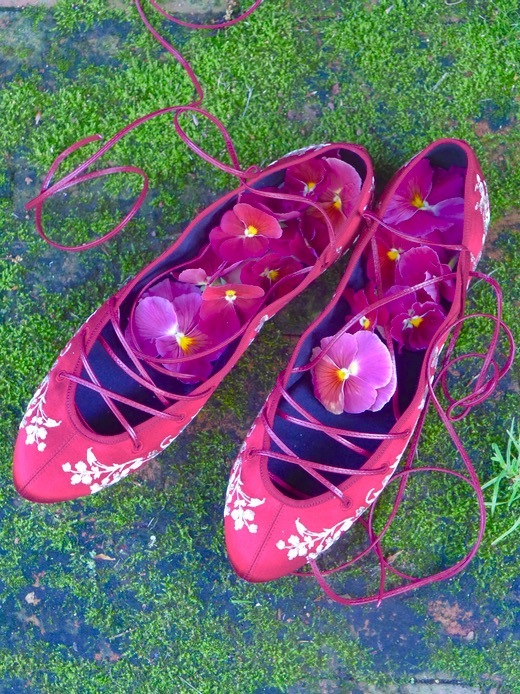 I was totally seduced by Etro’s crimson satin ballet slippers, drawn almost as much by the ribbon ties as the elegantly creamy flowers rambling around the edges. They’re so fragile that I don’t stray too far from the garden path lest they become even slightly smudged. 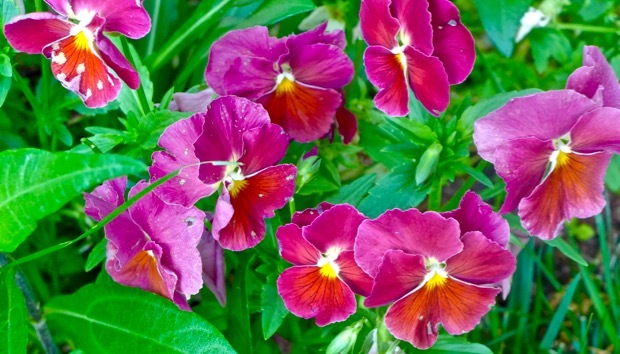 Isn’t it amazing that the slippers are very nearly the color of these antique pansies that at this very moment are blooming all over the garden, in the company of their lavender and peach confreres? 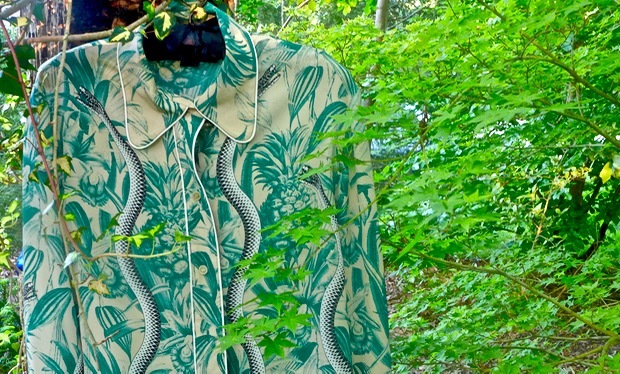 Alessandro Michele’s “Garden of Eden” blouse comes with slithering serpents and strange vegetation–perfect for our woodland-turned-jungle. Even more amazing: It’s not yet May, and already the heat and drenching rains are turning our woodland into a tropical jungle with dangling vines and impassable paths. Could there be serpents lurking beneath the hellebores (which, for reasons unknown, have only white and light green blooms this year)? 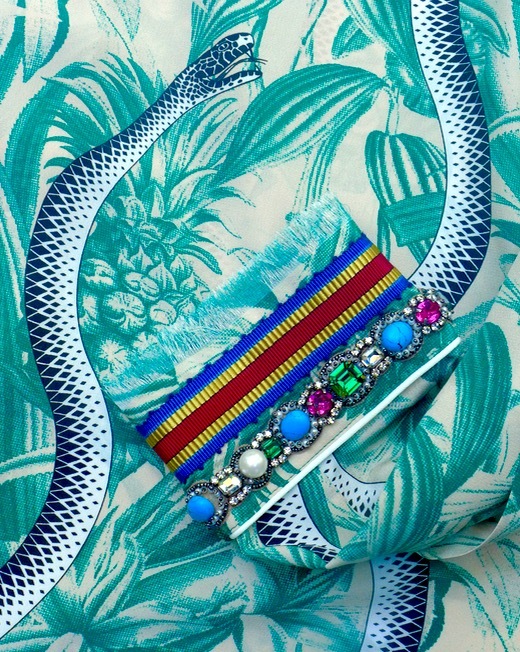 If not, there are plenty of serpents slithering up Alessandro Michele’s slinky blouse and skirt. Gucci’s new magician is getting lots of buzz for conjuring up clothing that you might actually want to wear–in fabrics that are absolutely riveting. This one is described merely as “embellished printed silk crepe de chine,” but check out the fantastical vegetation—pineapples, peculiar lilies and who knows what else, plus a flock of rampant snakes. 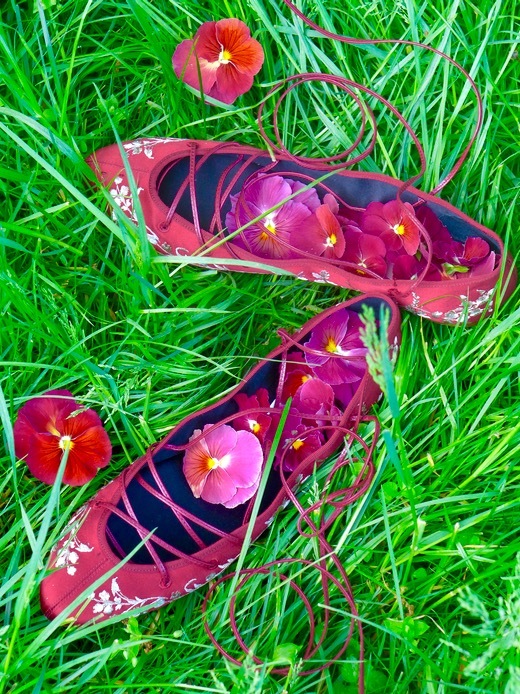 I love the crimson ballet slippers – they are the expression of antique pansies – wear them through the garden and fear not the smudge or wear. There is a season for pansies and then they are gone. I imagine you tiptoeing down the garden path and the pansies are delighted that you honor them so!